Orlando, FL (February 22, 2018): For the fourth year in a row, David Weekley Homes, the nation’s largest privately-held builder, was proud to collect a variety of items to stock the United Service Organizations (USO) Welcome Center inside Orlando International Airport. 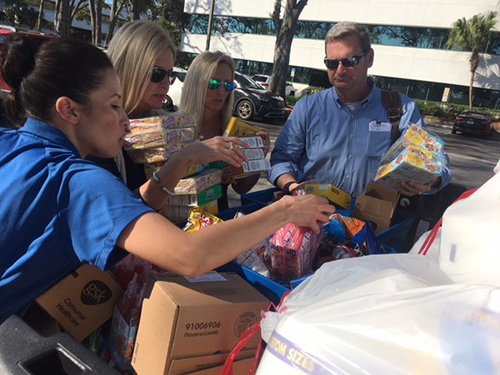 As part of the company’s philanthropic efforts through its CARE program, the Orlando Division partnered with homeowners, real estate agents and developer partners to collect more than 5,000 items, including granola and protein bars, individually packaged snacks, bottled water, coloring books and crayons, gift cards to restaurants and stores and more. In addition to the collection drive, The David Weekley Family Foundation donated one year’s worth of supplies totaling $2,750, including printer paper, ink and postage stamps, for the USO Welcome Center. The center, which opened in 2016, provides a living room with TVs, a children’s space, game station and free food and drinks for U.S. service men and women and their families to rest while traveling in the Orlando area. The center receives on average more than 60 guests every day. David Weekley Homes team members delivered donations totaling nearly $6,000 to the USO Welcome Center in the Orlando International Airport.